SEATTLE, WA - The first ever chair to incorporate a Mirror TV, touch control LED lighting, and Bluetooth® music capabilities is not only a one-of-a-kind, chair of the future, but an award winner. The chair was manufactured by Electric Mirror, the global leader in the Lighted Mirror and Mirror TV industry, and designed by Steelman Partners, one of the top 100 hospitality architectural and design firms in the world. They both entered their chair in the third annual Art of Design competition sponsored by the Las Vegas chapter of the Network of Executive Women in Hospitality (NEWH). The underlying structure of this object d'art is the "Ivar" chair by IKEA, a simple wooden frame chair from which all Art of Design contestants started their project. But, with the magic of Steelman's design and Electric Mirror's fabrication capabilities, Ivar was glammed and swaged in full-angled mirror dress and loaded with Electric Mirror's leading edge technologies. Electric Mirror built the chair to feature many of its technologies that that are transforming the hospitality industry. Keen™, Electric Mirror's energy saving touch technology reduces energy cost by up to 60%. The product includes touch dimming control, a night light, and automatic dimming when not in use. Bathroom Mirror TVs, the brightest and thinnest high-definition screens available, with 16.7 million colors, an LED backlight, and 16:9 screen ration. Electric Mirror's two sizes (15.6" and 21.5") of Bathroom Mirror TVs, are made at their Everett, Washington headquarters, and are designed to withstand moist and humid indoor environments. Vive™, transforms any of Electric Mirror's products into a wireless stereo system using Bluetooth® technology. Vive provides easy smart phone pairing, saves valuable counter space, requires no docking station, and allows guests to make calls even while still paired. Glasswaves™ Speakers, create tiny, undetectable vibrations in any surface to generate premium sound. Glasswaves Speakers are featured in Electric Mirror's Loft™ and Stanford™ Bathroom TVs, Mirrored Cabinets, and are an upgrade option for Entertainment Mirror TVs. The result is a work of art showcasing some of the most advanced Lighted Mirror technology in the world, all created by Electric Mirror. At a cost of $10,000, including hundreds of man hours to design and construct, the mirrored chair was both a creative and technical challenge. 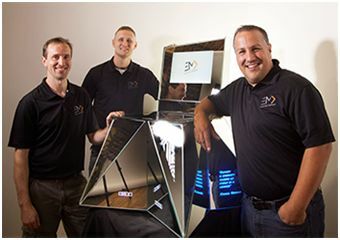 "Incorporating some of our mirror innovations into furniture was an exciting opportunity that we were thrilled to tackle," said Jim Mischel, President and Founder, Electric Mirror, adding, "This competition stimulated creative thinking within our company that may result in future product innovations." 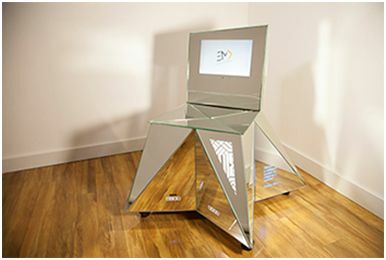 "We presented Electric Mirror with the faceted chair concept and they took the idea and ran with it. We were delighted when they offered to include a TV in the design. We were able to run a video with images of the vanity to showcase this technology," said Lisa Teal, Senior Project Director for Steelman Partners. "Their ideas, input, creativity and passion for this project took our design above and beyond anything we had dreamed of. We can't thank them enough." The Art of Design competition, sponsored by NEWH, was held in Las Vegas at the UNLV Barrick Museum on September 20, 2014. "The competition is not only an outlet for creativity and networking but a scholarship fundraising event as well," said Rich Gesteland, Electric Mirror's Director, Western Region. Winning chairs were auctioned at a gala event to raise funds for the 2014 Scholarship Program supporting hospitality students. The NEWH Chair Design Competition featured 16 total entries from design and manufacturer teams with winners in three categories: Judges Panel, Gallery Choice, and the category won by the Electric Mirror/Steelman Partners team, Popular Choice. For more information on the competition, go to NEWH. Steelman Partners and its affiliates, Dalton, Steelman, Arias & Associates, shop12 Design, MARQI Branding and Inviro Studios are based in Las Vegas, Nevada. These firms specialize in the multi-disciplinary facets of entertainment architectural design, interior design, lighting design, branding, graphic design, animation and master planning. The Steelman Partners organization has offices based in Macau, Zuhai, Ho Chi Minh City and Amsterdam. Established in 1987, the company and its affiliates have positioned themselves as industry leaders. The firm is well known within the gaming and hospitality industries, with a client list that includes Genting Group, Venetian/ Las Vegas Sands, MGM, Harrah's, Swiss Casinos, Sheraton, Hyatt, Plaza/El-Ad, SDJM, Melco, Caesars plus many others. For more information, please visit their website at www.steelmanpartners.com or contact: Kama Star, Business Development Coordinator at kama.star@steelmanpartners.com. Electric Mirror® is the leader in Lighted Mirrors and Mirror TV Technology serving the hospitality, healthcare, commercial and residential industries for more than 16 years. This family-owned and operated, company began in a garage pioneering the first high-end defogging mirror. An American success story, Electric Mirror continues to lead the market in design and innovation, holding more than 33 industry-leading patents with dozens more pending. Product lines include a wide variety of modern Lighted Mirrors, Mirror TVs, Waterproof TVs, Mirrored Cabinets, Corridor Lighting, and Makeup Mirrors. The company is the leader in Lighted Mirror technology, offering the first and only Bluetooth® enabled Lighted Mirror (Vive™) and an auto-dimming, energy savings Lighted Mirror (Keen™). Electric Mirror is the industry standard for major luxury hotel chains with a reputation for product innovation, customization and made-in-the-USA quality. Electric Mirror is on the forefront of eco-friendly manufacturing with its Beautiful World™ Initiative: To reduce the carbon footprint by producing the most energy-efficient and longest-lasting products in the world. The company headquarters and factory are located just north of Seattle in Everett, Washington. To request a quote for Electric Mirror products, please contact sales@electricmirror.com or phone 425.776.4946.